Celebrate the holidays with our annual Holiday Pops concert. Familiar works include the charming Winter Bonfire Suite by Prokofiev. Enjoy music from the television classic: A Charlie Brown Christmas. 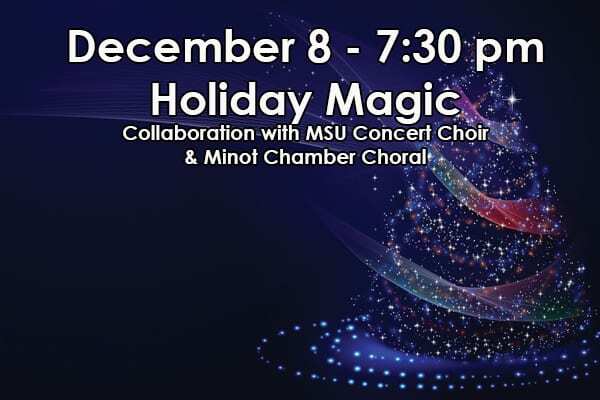 Once again we will collaborate with the Minot Chamber Chorale and MSU Concert Choir, to bring you the magnificent Gloria by F. Poulenc, featuring the angelic voice of soprano Clara Rottsolk, who has become a household name in Minot. She will also delight us with Mozart’s Alleluja! from Exsultate Jubilate and Mater Dei by Maestro Amaya! We will also bring you cheer with clever arrangements of Christmas favorites by David Lovrien among other familiar composers. Mozart: from Exsultate Jubilate K.
We would love to see you at this concert. It is going to be a great time. Get your tickets before they are sold out!